You will never find a better villa experience than here at Ave Maria. Every guest seems to find themselves feeling like part of the owner's family. A perfect stay is guaranteed; your only disappointment will be when you have to depart. The owners, a home builder and physician couple, have spent fourteen years restoring this incredible villa back to its original splendor and adding state of the art luxuries such as glass enclosed rain showers, an extremely large two room professional kitchen, formal gardens, rose and jasmine bordered swimming pool and of course free WiFi. No attention to detail was left undone. For example, they installed an elevator for the ease of bringing luggage up and down from the bedrooms. Frigo bars and TVs are installed in all of the bedrooms. For weddings, family parties, and business conferences, the lemonaia has been restored to a beautiful, all purpose room for additional dining or can be broken down into four office/teaching rooms with built in projectors. Like many Italian villas, this one has a remarkable history. Built originally in the 15th century as a summer home by a noble Luchesse family, it remained in the same family until the 19th century when it was given to an order of monks left homeless when Napoleon sequestered all church property. The monks divided the large rooms to smaller simpler ones and added a secondary school that was attached to the villa. 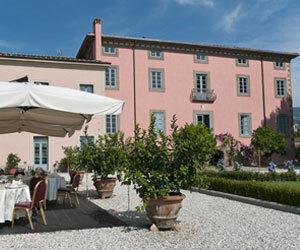 The current owners bought the property and spent the past fourteen years restoring it to its original beauty, including hiring their own "Michelangela", an artist from Florence who has been living in the villa for the past few years, painstakingly restoring the 18th century frescoes and adding her own interpretations as well. The villa looks over a parterre and a beautifully reconstructed formal garden from the original 1843 plans. Beyond the gardens is a vista of olive groves and rolling vineyards, a small village and the backdrop of the distant mountains. The villa is ideally located, within walking distance to a small village with shops and supermarket, and just seven kilometers north of the historic city of Lucca. Many stately villas are open as museums for touring, such as Villa Torrigiani. On the grounds is another remarkable restoration. The lemonaia has been converted into a large airy space for meetings and lectures. It can also be used for a back up reception room in case of rain. Villa Ave Maria is the ideal holiday home for families or friends, weddings, anniversary or family reunions, cooking or language classes or business meetings. It is ideally located among local vineyards and ideal for interesting daytrips, exploring Tuscany's finest cities, villages and countryside. Only a half an hour from the Pisa airport, it is also a good base to explore The Italian Riviera and the mountainous Garfagnana. For 2020, Villa Maria includes Daily Continental Breakfast served each morning buffet style to include American Coffee, espresso and cappuccino, tea, hot chocolate, milk, fruit juices, mineral water, fresh fruit , jams, honey, butter, sugar and sweeteners, corn flakes croissants, pan carre ( sliced bread for toast) , yogurts, cheese, tomatoes, cucumber, Parma ham, bacon and hard boiled eggs. On the ground floor there is a beautiful, spacious and light filled living room with chairs, sofas and coffee tables in a charming Italian style. This room is equipped with satellite TV and games and opens up to the beautiful gardens and a large covered terrace with tables and chairs and a nearby barbecue area. Adjacent to the living room is your private office where you have a PC, printer and copier and the wireless broadband internet mode. From the living room you reach the formal dining room with an impressive Tuscan table that can accommodate up to 27 guests. This room has a large frescoed ceiling painted by the owner's resident artist. From the other side of the large living room you enter a magnificent professional kitchen that also has French doors leading out to the garden and outdoor dining area. It is a cook's dream, with all the latest professional equipment, able to prepare a Tuscan feast for 100 or a simple breakfast for one. This kitchen will be a highlight for those that enjoy cooking. Beyond the kitchen is the pantry and guest bathroom as well as a fully equipped laundry room. It includes a professional washing machine, dryer, iron and ironing board. There are an additional two guest bathrooms that are handicap accessible as well as an elevator to whisk your luggage conveniently upstairs. Take the elevator or the staircase up to the first floor. At the stairs' landing the glass and mirrored elevator is on your right followed by a long hall way that runs along the north side of the villa. Just in front of the elevator there is a double bedroom with en suite bathroom with handicapped accessible shower. Across the hall are four bedrooms suites lined along the hallway that are mirror images of each other. Each suite is elegantly furnished and decorated with beautiful hand-painted ceilings in soft relaxing colors. All bedrooms have their own independent settings so that you can set the heat or air conditioning to your personal comfort. As you open the door to any of these suites, the floor plan is the same. You arrive in the entrance way and to your left is a fully equipped bathroom with marble tub with shower. Further on down the hallway is a walk in closet with safe and ample space for clothes as well as a luggage rack. Beyond the walk in closet is a cozy living room area with a very comfortable sofa bed and for your convenience each bedroom has a small refrigerator or 'Frigobar'. From the small living area, an open staircase leads to the loft en suite bedroom which has two twin beds that can be combined into a king bed. The room is spacious and holds a large armoire, a writing desk and a second frigobar. The en suite bathroom is just as beautiful as the one downstairs but has a large walk in shower instead of a tub. The fifth loft bedroom is at the end of the hallway, up a short flight of stairs. This bedroom suites two bathrooms with showers. As with all formal Italian villas, the immediate area around the house has fine pea - gravel that leads to the sprawling lawns that are well planned out. Tables and chairs that can comfortably accommodate forty guests are under a large white canopied gazebo. A paved path or a flight of steps, takes you to the walled formal gardens that have been re-created from the original gardens of 1600's complete with a large fountain and ideal for leisurely strolls of solitude and quietness- the air scented by the nearby walls of roses and over 100 potted lemon and grapefruit trees are scattered throughout the property. The views from the formal gardens look out over the valley and a quaint village. Once through the formal gardens, you are at the large swimming pool area, with banks of roses and jasmine climbing two sides of the ancient wall and create a canopy for shade as well as remarkable scents of rose, jasmine, citrus and herbs. An incredible relaxing experience! The Limonaia has been converted into a large meeting hall or dining room that can be divided into four private rooms if needed for meetings. Mid Week Bath and Pool Towel Change. Bed linens changed on Saturdays. The Lemonaia can be rented out for wedding receptions, dinners, and business meetings. Click on the date below to confirm availability. Discounted prices / last minute does not include arrival dinner or stocked mini bars. This Family friendly villa has a fenced in Swimming pool as a precaution for small children, The very kind owners ( a doctor and her husband) live in the piano nobile on the east wing of the villa. They have their own private entrance and parking area.